Posted on August 30, 2012 by mimijk •	This entry was posted in friendship, humor, life lessons, mindfulness and tagged creative thinking, simple truths. Bookmark the permalink. ROFL…LOVE IT. I read the first line and thought to myself…well, THAT’S not right. HAHAHA! my personal best was back when i had just started on wordpress and i was reading lots of blogs and i read this bloke’s post on something i cant remember now, which i loved and i typed the comment ‘brilliant! i wish i had a love button i love it so much’ , it was only after a day or two that i figured out what i had said i felt a real sense of embarssment but at least i made his day well probably 🙂 have an excellent day mims hope hubby is taking it easy! Laughing – I’m sure you made his day!! Lucky guy – probably still wondering what he did to deserve that one! Hope you’re feeling well my friend and keeping good thoughts for you and yours..Hubby is definitely taking it easy – arguably a bit more than the doctor would like! In law school they drilled into our heads that punctuation can cost you a case and a lot of money but I hadn’t thought about the danger beyond that : ) I still can’t use a semi colon properly. I’m learning to live with that. It makes all the difference in the world to put the punctuation in the right places. Thank you for an informative and humourous post. This is too good Mimi, it really gave me a laugh! My pleasure – it made me giggle too.. I love this! 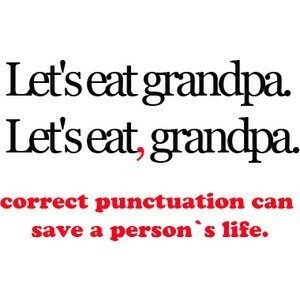 Punctuation is such a lost skill! It is a lost skill – becoming as obsolete as penmanship I fear. I love the post. However, I’m wondering what prompted the topic? Honestly? I saw it and it made me laugh.. ROFLMAO!! That’s brilliant! Love it!